So, hopefully a little inspiration for you all – and to put the story of my fitness and weight loss journey into perspective for those of you who don’t know me. 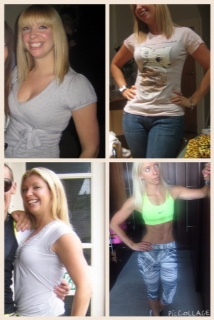 Above are three photos of me from approx 2008-2010 and then the bottom right taken two weeks ago – nearly three stone lighter, 4 dress sizes smaller and most importantly HAPPY with myself…. I literally cringe when I see these pictures of my double chin, muffin top, flabby arms….. and am so sad that I let myself get like this. I was stuck in a cycle of pointless diets, ineffective exercise regimes and then food binges when I realised my efforts weren’t getting me anywhere. I was so unhappy with myself that I “settled” in bad relationships that made my self esteem plummet even further. But one day I decided, enough was enough. No more dressing to hide my body. No more starving and binging. And no more people in my life bringing me down. Not a quick or easy decision to make – but for me the only one. Some months I made great progress, others none at all, and sometimes I even fell off the wagon completely. But I never gave up – and I hope that the photos above will show you that it may not be easy, it may not happen as quickly as you want it to, but if you commit to working hard, eating clean and staying focused – but above all NEVER give up – then you will get where you want to be. Keep going! The journey may be long but the destination is more than worth it.